‘High hills surround the valley, encircling it like a crown’ (Walter Daniel, 1167) | A balanced diet . . .
After the Normans conquered England in 1066, they quickly achieved hegemony over much of the country. By 1086 the ‘Great Survey’, the Domesday Book, had been completed for much of England and parts of Wales. At the same time, different religious orders began to spread their influence and established communities around the country. In a peaceful and secluded valley beside the River Rye in the heart of the North York Moors near Helmsley, a Cistercian community founded Rievaulx Abbey in 1132, their first monastery in the north of England. A second magnificent Cistercian monastery, Fountains Abbey, lies about 27 miles west of Rievaulx. Originally a cluster of wooden buildings, the abbey expanded over the next four centuries until Henry VIII’s Suppression of the Monasteries (after 1536). The abbey was abandoned and became the ruin we see today, still standing proudly in the landscape where it was founded. Not much can have changed in the intervening centuries. Rievaulx still exudes a profound sense of peace and tranquility. It’s not my intention here to provide a detailed history of Rievaulx Abbey. English Heritage owns and manages the site, and a detailed history of Rievaulx’s founding and growth can be found on its website. I first visited Rievaulx in the summer of 1968 at the end of my first year at university, when I went on a youth hosteling holiday on the North York Moors. Fifty years ago! I can hardly believe it. Then, in July 1988, when Hannah and Philippa were ten and six, we made a family visit while on holiday near the coast north of Scarborough. In 2013 we visited the National Trust’s Rievaulx Terrace that overlooks the abbey ruins (see below). A week ago we took the opportunity of a visit to our younger daughter Philippa and her family in Newcastle upon Tyne—and the improving weather—to visit Rievaulx once again. It’s actually only a few miles off the usual A19 route we take when traveling to Newcastle these days. It was a glorious sunny day. In fact, we enjoyed the first sensations of summer (the weather has since deteriorated, and it feels more like autumn as I write this blog post). The drive north from home (in Bromsgrove in northeast Worcestershire) took a little under four hours, including a 35 minute coffee and comfort break at the Woodall Services on the M1 south of Sheffield. On arrival at Rievaulx, we enjoyed a quick picnic lunch, then headed off to explore the ruined abbey and museum for about an hour and a half. Rievaulx Abbey ground-plan (courtesy of English Heritage). Click on the image to open a PDF file of this plan, another one and a map of the valley where the abbey stands. One’s first impression of Rievaulx are the ruins of the church, with tiers of pointed gothic windows on each side. There are some rounded and earlier Norman arches around the site. The eastern end of the church (enclosing the Sanctuary and Choir) was for use only by the monks. The western end, the nave (now completely demolished except for the bases of the main columns), was used by the lay brothers. To the south of the Cloister is large building housing the Refectory, and kitchen. The Day Room is located to the east of the Refectory, and this is where the monks worked on various activities, from mending clothes to copying manuscripts. South of the Day Room are the Tanning Vats where leather was prepared. Further east is the Infirmary Cloister and a staircase to what became the Abbot’s House. Above the doorway is an original in situ figurative sculpture of The Annunciation. There is a small museum displaying some interesting artifacts that have been uncovered on the site, as well as sections of sculptures that once adorned the various buildings of the abbey. 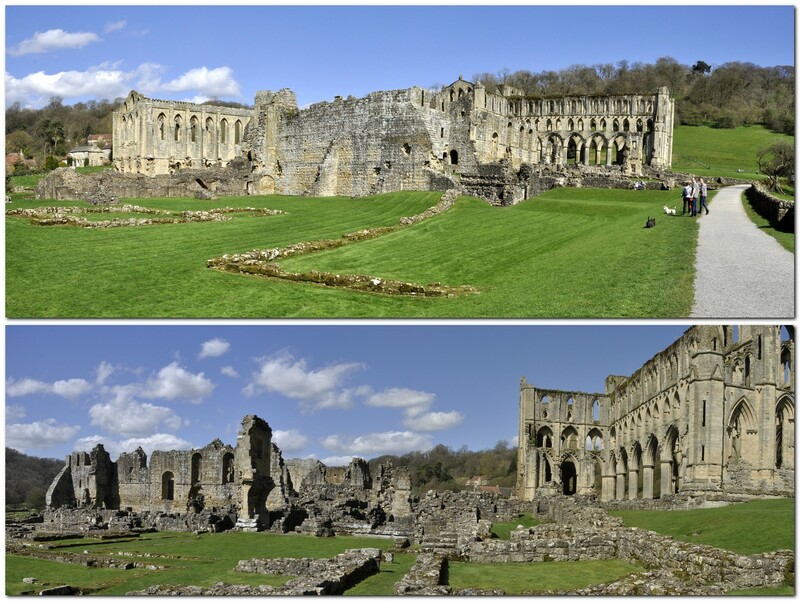 During its 400 years Rievaulx Abbey suffered several changes in fortune. There were raids from across the Scottish border, and the Black Death hit during the 14th century. The abbey was finally suppressed in December 1538, and the monks were cast out although they received a pension. The abbey was sold to Thomas Manners, Earl of Rutland although the most precious items were reserved for the crown. Thereafter the abbey buildings fell into ruin as we see today. But there has long been a fascination with Rievaulx Abbey, and in the mid-eighteenth century, Thomas Duncombe II constructed Rievaulx Terrace high on the hillside above the abbey ruins where his guests could be entertained and walk. There are some spectacular views of the abbey from there, as we experienced in 2013. This entry was posted in Out and about, Travel and tagged Cistercians, English Heritage, Rievaulx Abbey.